Phillip Bloom at the Film and Television Institute in Fremantle, Western Australia. Phillip Bloom showing us his new Canon C300 and giving the audience a major case of camera envy. 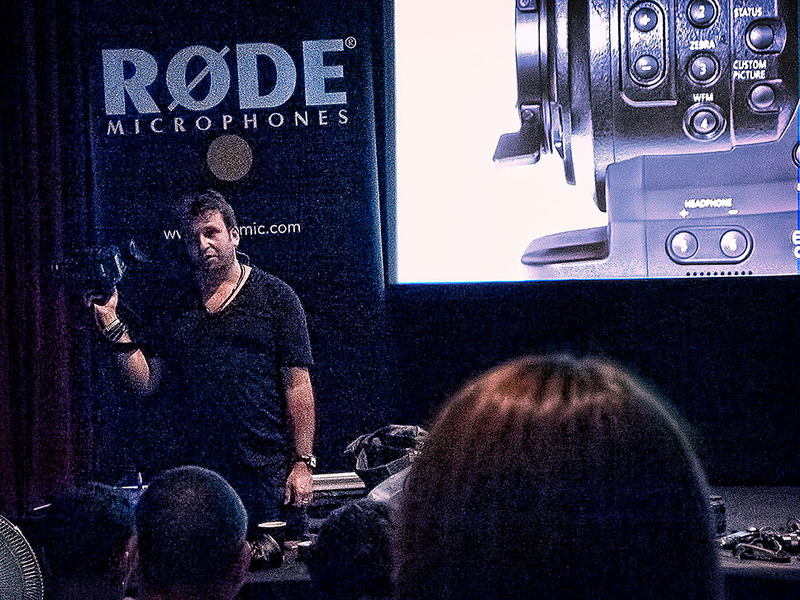 A seminar hosted by the Film and Television Institute in Fremantle and run in conjunction with Røde Microphones. Olympus Pen EP-2 with 14-42 mm lens. 1/30 sec. at f5.6, ISO 6400. Well yesterday was a bit of a monster. To start with the temperatures hit 40˚C, or 104 ˚F for the non metric readers. The second reason was that I attended a seminar by video guru, superstar and all round nice guy Phillip Bloom. The day was pretty full on as the air conditioning was non-existent and the venue was packed full, and the depth and range of the topics covered was considerable. I think that not coming from the film industry and not knowing my codecs from elbow it meant I was going to struggle at the best of times. Combine this with the torpidity inducing climatic conditions and I was in real danger of not comprehending a single word. Thankfully Phillip is a born entertainer, open, friendly and willing to share his expertise so he carried us all with his relentless enthusiasm. Now a day later sitting in the air-conditioned comfort of my office I’m trying to see where all this fits in with my work. There is no doubt that to do video well not only are you going to have to be prepared to drop shed loads of cash, but that it is probably beyond the scope of a single person. Really there needs to be two people working together on a project at the very least as there is just so much keep on top of. Editing and post production should really be handed over to an experienced editor. For short web-based projects it may be possible work as a single operator, but I think that to do a good job and if the clients budget could stretch to it I’d want to bring in someone else to ensure that everything runs to plan.